2nd grade teacher in Aztec, NM. Wait! Don't throw away that old tie. 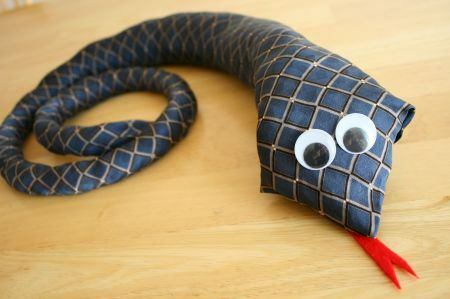 You can make snakes out of ties. Sew the bottom of the ties shut and stuff them with shredded plastic bags from grocery stores or stores. Another option is to use polyester fiberfill. They sell this at any craft store. After the tie is stuffed, sew the ties shut at the top. Sew on button eyes (Google Wiggle Eyes ) and a felt tongue. Use a large refrigerator box, have the students paint the box, and cut holes in it for the snakes to go in and out and around. A hit at our our fair. If you want to paint your tie, do it before you stuff it. You can do it after it is stuffed but it may be harder to paint in this state. You can integrate the language arts to the lesson by reading a book such as Mr. Tanen's Ties and then have students simply design their own neckties. They can paint them in the style of Van Gogh's A Starry Night (see sample) or Edvard Munch's The Scream . Make and Takes- They have a tie snake lesson there. Rowdy Grandma- They have a tie snake lesson there. SOLID NEON GREEN Satin Neck tie - If you want to use a solid green necktie for the project. See also solid white ties. The cheapest ties I could find at the posting of this link are the Polyester Neck Ties.